Fajitas are a crowd-pleaser because everyone can customize their own. This is a great on-the-go recipe because it literally takes just minutes to prepare (and minutes to devour as well). Cooking grass fed beef this way is ideal because it makes the meat nice and tender. You will be hard pressed to find grass-fed fajitas at any restaurant! Serve with any of the following: sprouted grain tortillas (core plan only), grated raw cheese, sliced avocado, cilantro, lime slices, salsa, organic sour cream, black beans, etc. Mix together the dry spices including the chili powder, cumin, coriander, salt and pepper. Rub the spice mixture all over the flank steak and place it in the bottom of the crock pot. Sprinkle the tamari or liquid aminos on top. 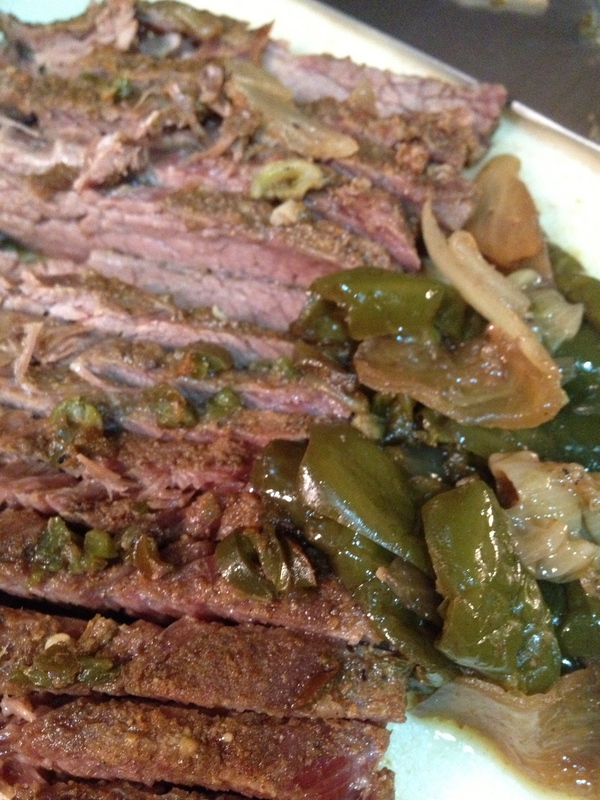 Top the flank steak with the diced jalapeno and minced garlic. Slice the bell peppers and onion and put them in on top. Turn the slow cooker onto HIGH and cook for 5 – 6 hours (meat should be very tender). Take the meat out and either slice with a very sharp knife or shred the meat using two forks. Transfer to a serving dish. Use a slotted spoon to get the peppers/onions out and place on the serving dish with the meat. Add the topping you want and voila…restaurant style fajitas at home!